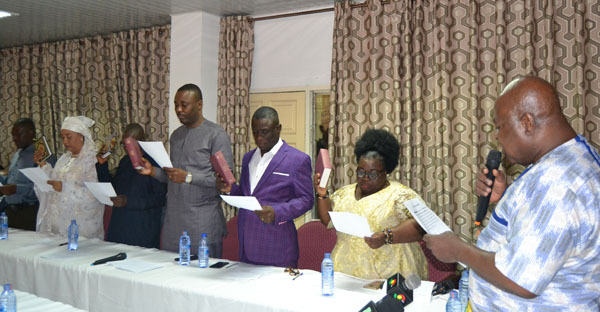 Seven nominees for the position of Municipal Chiefs Executive (MCE) in the Greater Accra Region, who have been confirmed by their respective assembly members, took the Oath of Office as required by law on Tuesday. They are Hajia Salma Mohammed Sani Adams Kuta, Ayawaso East; Kofi Ofori, Ablekuma North; Adwoa Amoako,Tema West; Aminu Mohammed Zakari, Ayawaso North; Boye Laryea, Okaikoi North; George Cyril Bray, Ablekuma West; and Gertrude Ankrah, Ga North. The Greater Accra Regional Minister, Ishmael Ashitey, who led them to take the three Oaths of Allegiance, Secrecy and Office, indicated that the event was in furtherance to the fulfillment of Article 243(1) of the 1992 Constitution of Ghana and Section 20 (1) of the Local Government Act 2016, Act 936. According to him the ceremony has become necessary to complete the process of putting in place the government’s machinery at the newly created assemblies of which the Greater Accra Region received 10 newly created assemblies. “While we wait for the remaining assemblies who are yet to confirm their nominees, there is the equal urgency to swear in the majority so that they can commence government business to bring development to their people” he opined. The regional minister while congratulating the MCEs on their nominations, appointments and confirmation, tasked them to see themselves as legislators, planners, managers of human and natural resources, with the requisite legislative instruments governing the performance of their duties. He stressed: “I will further urge you to update yourselves on the 1992 Constitution of Ghana; the Local Government Act 2016, Act 936; the Procurement Act 2016, Act 921; the Financial Management Act 2016(Act 921); the Internal Audit Agency Act (Act 658); the Local Government Protocols and Delivery Standards; and the Ghana Integrated Financial Management System (GIFMIS)”. Mr. Ishmael Ashitey further told them to be courteous and corporate with Members of Parliament (MPs) and chiefs and queen mothers, adding that they should as well serve as agents of positive change with keen interest to bring development to their people. The MCE for Okaikoi North, Boye Laryea on behalf of his colleagues, expressed appreciation to the president and minister for giving them the opportunity to serve at their respective levels. He gave the assurance that they would work to the expectations of the president.